When it comes to numismatic-related legislation, proposing commemorative coin programs can look like a pastime to the members of Congress. At the prompting of constituent groups, members will submit bills that have everyone excited but does not deliver on its promise. For now, the only commemorative coin program that has become law is the Naismith Memorial Basketball Hall of Fame in 2020. In March, members of Congress have introduced bills to create five more commemorative coin programs. All have merit but the reality is that most of these bills will not pass Congress. For the 116th Congress, there have been 16 numismatic-related bills submitted covering 13 different commemoratives (some are introduced in both the House and Senate to increase its chance of passage). One bill, Route 66 Centennial Commission Act (H.R. 66), was added to the watch list because the bill recommends a possible commemorative coin for the celebration. Maybe there will be something more exciting to report next month. This bill can be tracked at http://bit.ly/116-S639. H.R. 1805: To require the Secretary of the Treasury to mint coins in commemoration of the centennial of the establishment of the Tomb of the Unknown Soldier. This bill can be tracked at http://bit.ly/116-HR1805. H.R. 1830: To require the Secretary of the Treasury to mint coins in commemoration of the National Purple Heart Hall of Honor. This bill can be tracked at http://bit.ly/116-HR1830. H.R. 1865: To require the Secretary of the Treasury to mint a coin in commemoration of the opening of the National Law Enforcement Museum in the District of Columbia, and for other purposes. This bill can be tracked at http://bit.ly/116-HR1865. H.R. 1923: To amend title 31, United States Code, to require the Secretary of the Treasury to mint and issue quarter dollars in commemoration of the Nineteenth Amendment, and for other purposes. This bill can be tracked at http://bit.ly/116-HR1923. H.R. 1982: To require the Secretary of the Treasury to mint coins in recognition and celebration of the National Women’s Hall of Fame. This bill can be tracked at http://bit.ly/116-HR1982. As I peruse the non-numismatic news sources looking for coins and collecting-related information, I am surprised how much is published by the media in other countries about their coins. Interestingly, most of the stories are either from the Commonwealth Realm or those countries formerly a member of the Commonwealth Realm. A Commonwealth Realm is a sovereign country in which the Monarch of Great Britain, currently Queen Elizabeth II, is the reigning constitutional monarch and head of state. The role of the queen is largely symbolic as the government of each country manage its domestic affairs. As part of this management, each country produces its own coinage. Within the Commonwealth Realm, the largest state-run mints are the Royal Mint, Royal Canadian Mint, Royal Australian Mint, and Perth Mint. There are other private mints that produce legal tender coins, but these are the only government-owned mints in the commonwealth. Every time one of these mints issues a new coin for circulation, the information is all over their country’s media. For example, in the run-up to the issue of the Peter Rabbit circulating 50p commemorative as part of the Royal Mint’s Beatrix Potter series, nearly every news outlet in the U.K. has been covering the anticipation. This phenomenon is not restricted to the Commonwealth Realm. Former Commonwealth members also heavily promote their coins. We know that India is issuing a 12-sided 20 rupee coin along with other new designs. South Africa Reserve Bank is issuing circulating coins to celebrate the country’s 25 years as a Constitutional Democracy. Yet the United States press has been largely silent. Sure, there are blurbs when a congressperson drops a bill into the virtual hopper but the press has been silent after that. While there were other things going on in December, there was very little reported about the Naismith Memorial Basketball Hall of Fame Commemorative Act for 2020. 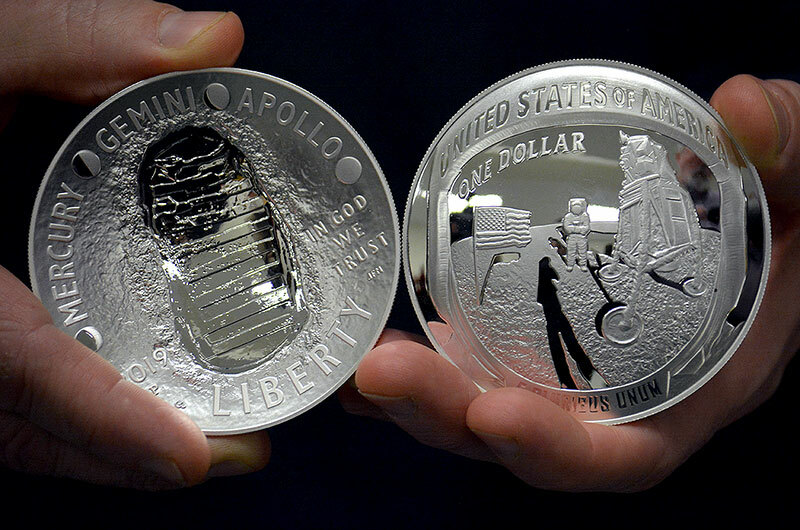 There was hardly a peep out of the press for the Apollo 11 50th Anniversary Commemorative coins. Even with the political turmoil, this country should be commemorating one of its greatest feats of the 20th century that did not involve bombs or bullets. 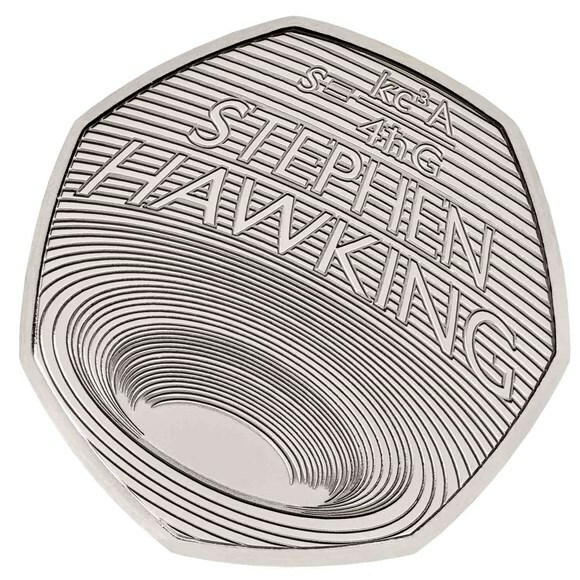 There has been more coverage in the science and tech-related press about the release of the Black Hole coin honoring Stephen Hawking by the Royal Mint. To its credit, the American Legion has been promoting the 100th Anniversary commemorative coins to their members. However, was there any general media outlets covering the program’s release? The hobby is perceived to be dying because it is not attracting new members. How can the hobby attract new members when it does not promote itself outside of its insular bubble? I am sure that I will hear from the bullion sellers because they have been crowing about the steady rise of gold prices. Aside from being an investment and not a hobby issue, the rise of gold prices is alarming. Investing in gold and other precious metals is seen as a safe-harbor move when investors predict that markets will be less lucrative. If investors are pulling money out of other investments to invest in gold that means they do not trust the markets and we may be in for problems. If we stop worrying about what is good or bad for the hobby and figure out how it could survive, maybe we can attract new collectors. First, we have to do is to let everyone know the hobby still exists. One of the most disturbing stories relating to numismatics is the conviction of a man for killing someone for his coin collection. In Colchester, England, Gordin McGhee, 52, was stabbed in his flat by Danny Bostock, 33, who broke in to steal a set of Beatrix Potter 50 pence coins. Both men were familiar with each other from local coin club meetings. Over the last few years, the English tabloids have been publishing stories about how low-mintage, modern circulating 50p commemorative coins were being sold for hundreds or thousands of pounds on eBay. This has awakened the public about the potential for collecting these coins. 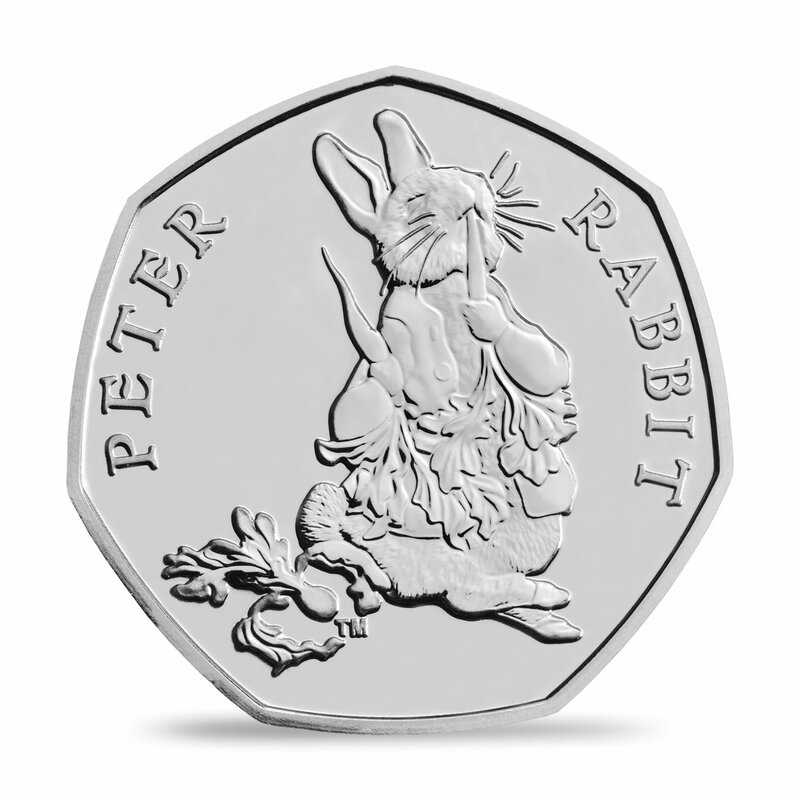 The Royal Mint has been producing 50p coins commemorating the animals featured in Beatrix Potter’s stories since 2016 including Peter Rabbit. By the time the country caught on to their value, the limited edition 2016 and 2017 coins were being hoarded and becoming more difficult to find. People who wanted a complete collection turned to the secondary market. Of course, where there is a demand the person who can provide a supply can make money. According to news reports, Bostock snuck into McGhee’s flat to steal his collection of Beatrix Potter coins while McGhee was not home. Unfortunately, McGhee returned home and found Bostock in the act. Bostock stabbed McGhee 17 times and tried to set the place on fire to cover up the crime. Police were able to track the trail of blood Bostock made with his shoes to Bostock’s home. Bostock was convicted after using the defense that someone else wore his shoes after a drinking party even though the police found the shoes, coins, and the murder weapon in his possession. Although this type of situation may not happen over the National Parks quarters, we did see the greed of dealers put the public in danger for the release of the 2014 50th Anniversary Kennedy Half-Dollar Gold Proof Coin. Dealers handed out cash to needy people who did not conduct themselves in a manner that is consistent with the ANA Code of Ethics so they could buy the coins first without having to worry about U.S. Mint purchasing limits. In this case, nothing happened to the dealers who should have been dealt with by the ANA. They could have lost money since the release was not a sellout and the price of gold dropped, but we will never know. While the mainstream media has mostly been distracted by other activities in Congress, those of us who watch numismatic-related legislation have had our own action. First, the House of Representatives passed Route 66 Centennial Commission Act (H.R. 66) to create a commission to celebrate the centennial of the famous Route 66 in 2026. Although this is not a numismatic-related bill per se, if passed, the bill says that the centennial commission will recommend commemorative coins for this event. The bill has been referred to the Senate Environment and Public Works Committee waiting further action. The other legislation of note is the Monetary Metals Tax Neutrality Act of 2019 (H.R. 1089) that removes all tax considerations for the sale of “gold, silver, platinum, or palladium coins minted and issued by the Secretary at any time.” It also exempts “refined gold or silver bullion, coins, bars, rounds, or ingots which are valued primarily based on their metal content and not their form.” This means that no capital gains on the sale of these items will be taxed and no losses can be written off by the taxpayer. An interesting side effect of this bill would be that the gains realized when rare coins auctioned for millions of dollars will not be taxed. This means if an 1804 Silver Dollar sells for more than the $3.8 million it sold for in 2013, the seller will not pay capital gains tax on the sale. However, if it sells for less, the seller will not be able to write-off the loss. For those keeping score at home, this law will not help the sale of a 1913 Liberty Head Nickel since its composition is copper and nickel. Of course, this will only be an issue if H.R. 1089 passes and the president signs it into law. Summary: This bill establishes the Route 66 Centennial Commission to honor Route 66 on the occasion of its centennial anniversary.The Department of Transportation shall prepare a plan on the preservation needs of Route 66. This bill can be tracked at http://bit.ly/116-HR66. Summary: Monetary Metals Tax Neutrality Act of 2019This bill exempts gains or losses from the sale or exchange of certain coins or bullion from recognition for income tax purposes. The exemption applies to gains or losses from the sale or exchange of (1) gold, silver, platinum, or palladium coins minted and issued by the Department of the Treasury; or (2) refined gold or silver bullion, coins, bars, rounds, or ingots which are valued primarily based on their metal content and not their form. This bill can be tracked at http://bit.ly/116-HR1089. This bill can be tracked at http://bit.ly/116-S457. This bill can be tracked at http://bit.ly/116-HR1173. H.R. 1257: To require the Secretary of the Treasury to mint coins in commemoration of the United States Coast Guard. This bill can be tracked at http://bit.ly/116-HR1257. S. 509: A bill to require the Secretary of the Treasury to mint coins in commemoration of the United States Coast Guard. This bill can be tracked at http://bit.ly/116-S509. At noon on January 3, 2018, the 116th Congress gaveled into session. The first day of a new congressional session is mostly ceremonial and procedural. Leaders are chosen. Rules are established. Committees are formed. And the House of Representatives gets to work on a new budget. Usually, the budget the House starts with is for the next fiscal year. This year, the 115th Congress did not finish their work and left the government unfunded. It does not matter whose side you are on or what animal you worship, the bottom line is that 800,000 federal employees, many more contractors, and the businesses that rely on their patronage were hurt. Sure, the federal employees will earn back pay but the contractors who were furloughed will not. The businesses that serve these people will also not be made whole. But that did not stop members of Congress from submitting bills for consideration. As I write this, there have been 842 bills submitted in the House of Representatives and 268 in the Senate. Of those bills, only four have numismatic significance. All four bills were also submitted in the 115th Congress but had died in committee when that Congress adjourned for the final time. As of now, the Financial Services Committee, chaired by Rep. Maxine Waters (D-CA), has not posted the rules as to what it will take for numismatic-relation legislation to move forward. Since the 112th Congress, the committee required a numismatic bill to have 250 co-sponsors. But since the control of the committee has changed parties, we will have to wait until the committee publishes their rules. Summary: This bill directs the Department of the Treasury to mint and issue $5 gold coins and $1 silver coins in commemoration of the 150th anniversary of the Carson City Mint in Carson City, Nevada.All surcharges from sales of such coins shall be paid to the Nevada State Museum Dedicated Trust Fund. This bill can be tracked at http://bit.ly/116-HR61. This bill can be tracked at http://bit.ly/116-HR500. H.R. 636: To require the Secretary of the Treasury to mint coins in commemoration of Muhammad Ali. This bill can be tracked at http://bit.ly/116-HR636. S. 239: A bill to require the Secretary of the Treasury to mint coins in recognition of Christa McAuliffe. This bill can be tracked at http://bit.ly/116-S239. It seems that in my attempt to highlight numismatic-related news from somewhere other than the United States I may have done my wurst! While the story about the currywurst commemorative coin seemed like something to poke fun at, I was reminded that Staatliche Münze Berlin, the Berlin State Mint (www.muenze-berlin.de), is not an official government mint. It is a private mint that has been contracted by the German government to assist in producing coins. 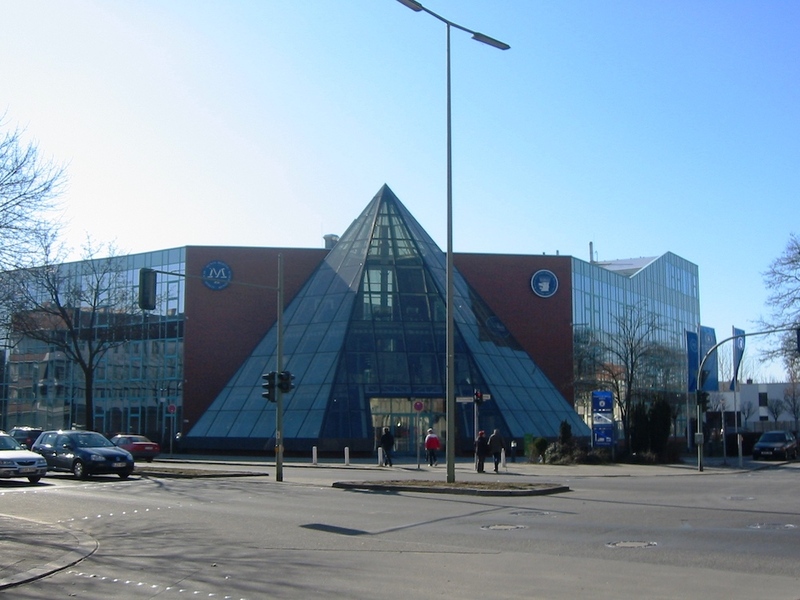 Their website reports that they produce one-fifth (20-percent) of all German coins. Reports suggest that the Staatliche Münze Berlin has been under contract to Latvia to produce legal tender coins since 2014. It appears that Staatliche Münze Berlin would be to Germany as the Pobjoy Mint is to the United Kingdom. Both a private mints that are contracted to strict legal tender coins that create their own commemorative. This might mean we are safe from coins commemorating poutine and haggis. However, the idea of mixing curry with ketchup may be worth a try! It is interesting to see what some countries choose to commemorate on coins. For Staatliche Munze Berlin, the Berlin State Mint, they chose to commemorate the 70th anniversary of currywurst. Currywurst is considered the national fast food delicacy of Germany. It is a pork sausage that has been sliced part of the way through, boiled then grilled, and served smothered with ketchup mixed with curry powder. Curry powder is sprinkled on top. According to a friend who spent time working in Germany, currywurst stands are as ubiquitous in Berlin and many other cities as hot dog stands are in New York. Depending on the stand, they can be served on buns, with sauerkraut, or fries. Since returning to the United States several years ago, he says that his family enjoys the German dish frequently. Coins have been used to commemorate many things. Commemorating food on coins is nothing new. Coins have been used to commemorate agricultural products like wheat and corn. But aside from the (in)famous bottlecap-shaped coin, I cannot remember when a coin was used to commemorate a prepared food. Now that the Berlin State Mint has broken this barrier, who’s next? Will the Royal Canadian Mint produce a coin honoring poutine? Or will the Royal Australian Mnt grace a coin with Vegemite? I don’t even want to think about a coin commemorating haggis! Pairing U.S. coins with a foreign coin for sale has been done in the past by the U.S. Mint. In 2002, the U.S. Mint offered the “Legacies of Freedom” This week, the U.S. Mint announced a collaborative project with the Royal Australian Mint to produce a commemorative coin set in celebration of the 50th Anniversary of the Apollo 11 Moon landing. 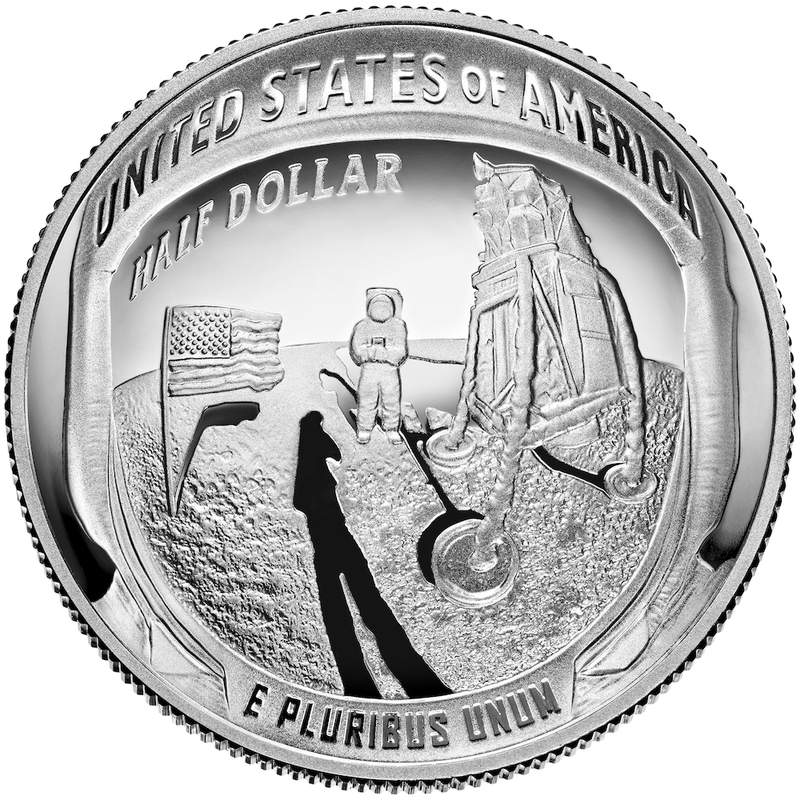 The set will feature a U.S. Apollo 11 50th Anniversary Half Dollar paired with an Australian 50th Anniversary of the Moon Landing 1 oz. $5 Silver Coin. The announcement noted that the set will be produced and sold by the Royal Australian Mint with marketing help from the U.S. Mint who will put a link on their website. set. A limited edition of 50,000 sets that included an uncirculated American Silver Eagle $1 coin and a £2 Silver Britannia from the Royal Mint. These sets were created and marketed by the U.S. Mint with a price of $49.88 per set, noting that the spot price of silver was $6.39 per troy ounce. Prior to that, the U.S. Mint produced the 2000 Leif Ericson Millennium Commemorative Set that included a 2000 Leif Ericson Proof Silver Dollar and a 1000 Kronur proof silver coin produced by the U.S. Mint for Iceland. It was the last coin the U.S. Mint produced for a foreign government. The U.S. Mint sold 86,136 sets at a price of $63 per set. The press release says that it will be a “limited production set” but does not specify how many sets will be produced. Other than the legal requirements that the U.S. Mint shall not lose money on a commemorative coin program and that the half-dollar includes a $5 surcharge, what are the financial arrangements between the two government mints? Who will handle the fulfillment of orders from the United States? Those who have purchased items from Australia and New Zealand know that the because of shipping and customs restrictions, items can take 6-8 weeks to enter the United States before it can be given to the Postal Service for delivery. These questions will be addressed to the U.S. Mint as soon as Tuesday. Even though the U.S. Mint continues to operate during the shutdown, offices in Washington, D.C. will be closed on Monday because of 8-12 inches of snow that covers the region. It should come as no surprise to anyone that the 115th Congress left unfinished business. As we start the new year, 25-percent of the executive branch does not have the legal funding to operate. Those with leftover funds operated as long as they could but are now closed pending congressional action. As with previous shutdowns, the U.S. Mint and the Bureau of Engraving and Printing are not affected. Both agencies are self-funded from their profits (seigniorage) which is held in their respective Public Enterprise Funds. The 115th Congress is constitutionally scheduled to end at 12:00 noon on January 3, 2019, when the 116th Congress will begin. Congress will take up the new funding bills as part of the opening session. When the new Congress gavels into session, any bill pending from the 115th Congress will be removed from the docket. It will be said that these bills will die in committee. Summary: (Sec. 3) This bill directs the Department of the Treasury to mint and issue not more than 50,000 $5 coins, 400,000 $1 coins, and 750,000 half-dollar coins in recognition and celebration of the Naismith Memorial Basketball Hall of Fame.The coins shall be in the shape of a dome, and the design on the common reverse of the coins shall depict a basketball. Treasury shall hold a competition to determine the design of the common obverse of the coins, which shall be emblematic of the game of basketball.(Sec. 7) The bill requires all sales of such coins to include specified surcharges, which shall be paid by Treasury to the Hall to fund an endowment for increased operations and educational programming. This bill can be tracked at http://bit.ly/115-HR1235. The Naismith Memorial Basketball Hall of Fame Commemorative Coin Act was sent to the White House for presidential signature on December 19, 2018. The president has ten days to act on the bill. He can sign the bill, which there is no indication that he has, and it becomes law. He could veto the bill to prevent it from becoming law. But what if he does not sign the bill? If Congress was still in session then the bill automatically becomes law. If Congress adjourned then the bill does not become law. That is called a pocket veto. Because of the shutdown, Congress did not adjourn while trying to resolve the issue. There were pro forma sessions, meaning that a representative gaveled in the House and Senate only to adjourn for the day. If the president did not sign or veto the bill, it has become public law. However, since the Government Printing Office (GPO), the official publisher of the U.S. government, is closed because of the shutdown, they cannot publish the results of legislation passed or vetoed. Therefore, we do not know whether this bill is now the law. Previous administrations would announce bill signings in their regular news streams. This White House has chosen to discontinue that practice leaving us at the mercy of the currently closed GPO. In December, the Senate passed the National Law Enforcement Museum Commemorative Coin Act by a voice vote. Although the bill was sent to the House for consideration it never left the committee and will die in committee when the 116th Congress is gaveled into session. Finally, Rep. Bruce Poliquin (R-ME), whose district includes Kennebunkport, introduced the President George H. W. Bush and Barbara Bush Dollar Coin Act. Essentially, this would have extended the Presidential $1 Coin program to include President George H.W. Bush and First Lady Barbara Bush. This bill, like many others, died in committee. This bill can be tracked at http://bit.ly/115-HR7257. A full review of the 115th Congress will be published shortly after the government reopens and the GPO resumes its publishing operations. This week, the U.S. Mint made the most impact in the world of numismatics. first, the U.S. Mint released the first coin in the American Innovation $1 Coin Program. It features a new design of the Statue of Liberty on the obverse, which has not been favorably received. 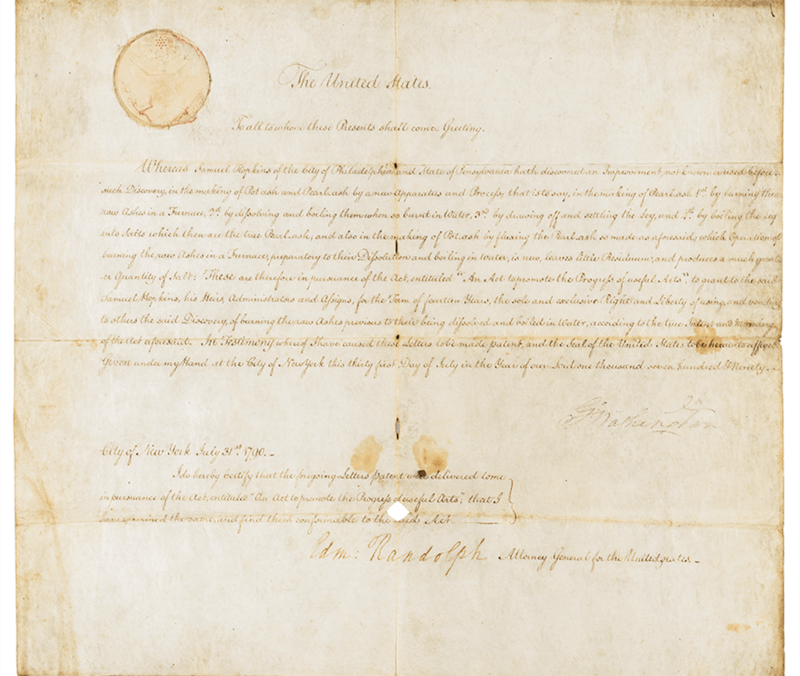 The reverse recognized the first U.S. patent signed by President George Washington. On July 31, 1790, Samuel Hopkins was granted patent number X00001 for this method “in the making of Pot ash and Pearl ash by a new Apparatus and Process.” In June of this year, the U.S. Patent and Trademark Office (USPTO) issued Patent #10,000,000 based on the current numbering system that began in 1836. According to the USPTO, there were 9,433 patents issued from 1790 through 1835. The other news from the U.S. Mint was the first strike ceremony for the Apollo 11 50th Anniversary Commemorative Coins at the Philadelphia Mint. Children of the three astronauts who flew on Apollo 11 represented their fathers at the ceremony: Mark Armstrong, Andrew Aldrin, and Ann (Collins) Starr. Coins will be offered for sale to the public on January 24, 2019. The money raised from this commemorative coin program will benefit the Astronauts Memorial Foundation, the Astronaut Scholarship Foundation and the Smithsonian National Air and Space Museum’s “Destination Moon” gallery.